Google's failure to achieve adoption stems from the fact that it is impossible for anyone to build meaningful tools at scale on top of today's fragmented health IT backbone. The next step should be clear. We need to forget about separate Electronic Medical Records and Personal Health Records and start thinking about “Collaborative Health Records.” Core health data such as medical problems, medications, allergies, and medical procedures should be automatically populated by clinical information systems. Individuals should be able to easily track chronic disease management and health-related behaviors using applications on their cell phones, tablets, computers, and television. Of course, much of this data should be automatically populated by devices such as glucometers and blood pressure cuffs. The “Collaborative Health Record” will then facilitate fruitful communication between individuals and their clinical health coaches because they will have a common ground. Here in New Media Medicine, we are opposed to making claims if we are not actively building a solution. In fact, our CollaboRhythm platform is built on the notion of a “Collaborative Health Record”. It uses the Indivo X Personally Controlled Health Record as its back-end, but it also uses the same record for clinical documentation and for communication between individual and health coach. So the personal health record is still an important part of the solution, but only if it is used to its full potential. When Oovit PT was first conceived, we decided to use Wiimotes to capture user motion because of two reasons: (i) They provided us with low-cost motion sensing with the capability to provide data wirelessly over bluetooth (ii) It was a quick way for us to get started on the project because of existing support for connection to PCs. Now that we have created a more tangible demonstration of our concept, we decided that it is time to move away from Wiimotes. One of the reasons to do this is that a bulky Wiimote is not conducive to a reasonably unobtrusive physical therapy experience. The second and more important reason to do this is that much smaller sensors would mean that users would willingly wear them for longer periods of time. This would enable continuous monitoring of motion not only during physical therapy but also during other activities throughout the day that might affect their condition. Eli Pariser's TED talk "Beware of online 'filter bubbles'" and book documents the rise of personalized algorithmic filtering on the web, namely the use of our past, online behavior to determine the content shown to us in the future. The Filter Bubble is a metaphor of what happens when our past determines the future content we see. Pariser explores the societal implications of filtering: the amplification of bias, echo chambers, loss of serendipity, etc. Although he is raising consciousness on an important issue of the day, his discussion feeds the alarmists. Predictably, popular and social media have done what they do best, amplify fear. While academic discussions and the New York Times have reasonably measured coverage, if we are to believe some posts, we could be facing the death of democracy as we know it. The Quantified Self conference brings together self-trackers, DIY'ers, entrepreneurs and journalists. This group strives to bring numbers acquired from our everyday activities into the decisions we make in life. Health and wellness are two of the most prevalent topics in the Quantified Self and a number of our collaborators will be there. Ian will give a short ignition talk at lunch time titled: "What can I learn from your self-experiment?". This talk will preview some of his new PhD research. The Reede Scholars Health Equity Symposium featured an informative keynote by David Blumenthal, former National Coordinator for Health Information Technology under President Barack Obama. His talk described current efforts in Washington to advance the health information technology infrastructure of the United States with an eye on health disparities. It was extremely exciting to hear that there is a push being made to give patients access to their entire medical records and that there is a strong appreciation for the importance of patient participation. John Moore of New Media Medicine was part of a panel including Blumenthal that dug deeply into how health information technology can be used to address inequity in healthcare. The Harvard Gazette article highlights Moore's contribution in the last paragraph. John Halamka, Chairman of the Healthcare Information Technology Standards Panel and the CIO of Harvard Medical School and Beth Israel Deaconess Medical Center, concluded the meeting with an inspiring talk that featured work that will be done this summer in Washington on the topics of patient identity, authentication, and certification of data as they pertain to health. It sounds like they will hit on many of the issues that we began addressing in Health and Wellness Innovation 2011 in the Online Health Identity project. Awesome! "Tapping into smart health" by Marion Davis explores the potential of mobile health applications on smart phones. It surveys some of the latest research and also summarizes some of the widely available applications. CollaboRhythm is featured on page 2 of the online article. 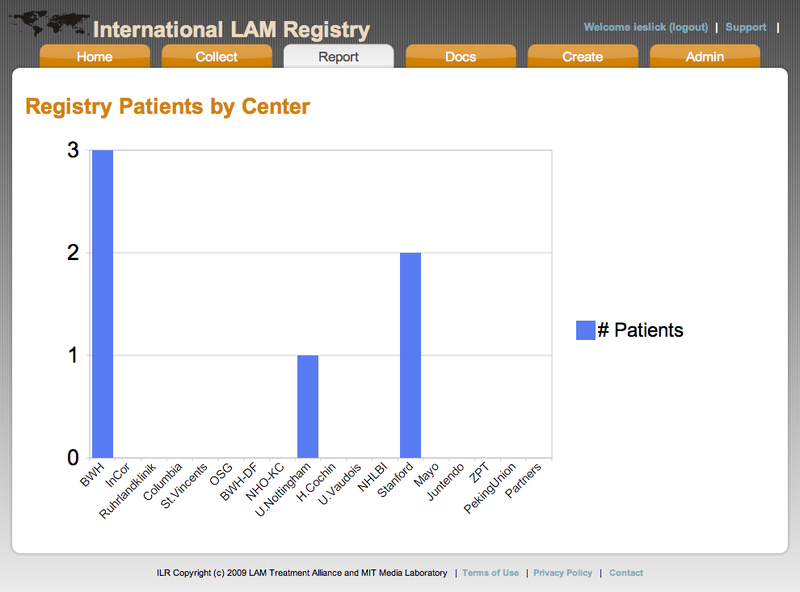 The International LAM Registry (ILR), introduced to the Lymphangioleiomyomatosis (LAM) research community last year, is an outgrowth of the patient outcome reporting and hypothesis-generation site LAMsight and the second joint venture between New Media Medicine and the LAM Treatment Alliance. The 7th Annual Games for Health Conference is being held on May 17-19 in Boston, MA. The event brings together a variety of researchers, game developers, and health professionals to review, brainstorm, and collaborate on how videogames, and videogame technologies are finding new roles in health & healthcare. There are major tracks on exergaming, sensorimotor rehab, nutrition games, medical training, and cognitive & emotional health. Pre-conference events focus on mobile games, game accessibility, and medical modeling & simulation. Sai will be presenting on Oovit PT in the Sensorimotor Rehab track at 3:15pm on May 18. The opening keynote is Dr. Martin Seligman, widely known as the father of positive psychology. He will deliver a speech titled Positive Psychology>Positive Computing>Positive Videogames. The second keynote will be Dr. Roni Zeiger, chief health strategist for Google. Dr. Zeiger is a practicing physician who helps direct Google’s health oriented projects such as health search, Google Body, Google Flu Trends, and Google Health. Zeiger’s talk, titled “The Last Mile Doesn’t Have to be the Hardest: Solving Problems Between Games and Health,” will focus on the needs and possible strategies to better connect people to systems and behaviors that can make them healthier. Fragmentation is a significant barrier to the progress of health information technology. Early adopters of online services and health devices are finding it excruciatingly difficult to manage their data across disconnected platforms. This hinders their ability to make use of the data and discourages them from further engagement. We cannot expect mainstream adoption and improvements in population health if early adopters are not being given a compelling experience. During Health and Wellness Innovation 2011, Dazza Greenwood from the eCitizen Foundation, Rob Masson from EMC, Stephen Quatrano from Cisco began tackling this problem by prototyping an online health identity service that is open source and that uses open standards. Its goal is to serve as a consistent ID for people across electronic medical record systems, personal health records, online health services, and networked health devices. It becomes the glue for successful marshalling of data and for maintaining patient data privacy. The team has envisioned some exciting advances for this identity including the ability to provision certificates to individuals and to health professionals so that they can digitally sign data placed into personal health records. Also, the system could escalate the level of authentication required by a user based on the context in which the identity is being used. For example, to fill a prescription at a pharmacy, the user may simply have to enter a password. To authorize sharing data from the record with someone new, however, the user may have to use a password along with an RSA SecurID or biometric data such as a fingerprint scan or facial recognition. This will help to ensure that private health data remains private while at the same time minimizing the burden on individuals. The stethoscope... one of the most iconic tools used by physicians… a barrier patient-centered care. There is definitely nothing patient-centered about a clinician putting a stethoscope in his or her ears and proceeding to command a patient through a series of position changes and deep breaths only to conclude with “everything sounds fine” or “hmmm”. For patients to become truly active participants in their care, we not only need to rethink our communication and educational tools but also every medication instrument that we use. Sure, there are some patient-friendly versions of pedometers, sphygmomanometers, and glucometers coming to market, but what about the time-honored clinician tools like the otoscope, ophthalmoscope, and stethoscope. The patient should be able to hear everything that the clinician hears and see everything that the clinician sees. The instruments should be in every patient home as well. They should be inexpensive and easy to use. Even more important, they need to be reinvented so that they will fit into a modern model of healthcare delivery. They need to be networked with the ability to remotely control them and for them to stream data securely over the web. Patient and coach should be able to explore the data together and make comparisons not only over time but also across populations. Yadid Ayzenberg of the New Media Medicine group has started this endeavor with the stethoscope. He is building a new tool that will not only meet the goals described but that will also be completely open source. Everything about the device from the shell to the electronics to the software will be fully documented and shared openly with the world. Each of the components is being specifically chosen so that the entire device can be fabricated at an extremely low cost with tools that are already available in fab-labs around the world and that you may soon have in your garage. Your next DIY project might be to build your own stethoscope (of course one that only faintly resembles the one that your pediatrician used to use… you know, the one with a fuzzy little animal glued to it so that it would appear more “patient-friendly”).